First, I’m happy to say if you are reading this blog I can assure you that you have been a part of me and Carolyn’s life, more than any of us could possibly understand and like all things, only He truly knows. Therefore, it is important to us that you are aware of what God is currently doing in our lives. I am getting married to the love of my life! Words can’t express how blessed I am. I titled this blog transition because we are on the brink of some big ones. To date, I have been serving in South Africa for two years. My passion for this place and these people still continues to grow. Over the last two years, the Lord has made South Africa my home. This has been even more evident as my departure date has quickly been arriving over the last few weeks. I look forward to sharing what God has done over the last two years with you all soon. So what’s next? Before Carolyn and I even began praying about our relationship, Holy Spirit gave us clarity about our future. First, He made it abundantly clear that we were to spend the rest of our lives together. Second, He made it abundantly clear for us to be married and serving together in South Africa. With this clarity, I wish I could end the blog here and everyone including me and Carolyn would have complete peace with this word from the Lord. However, excuse my vulnerability or rather praise it while I unpack my thoughts. I am scared. I am nervous. 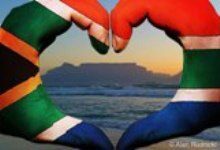 Will people understand how I have changed while living in South Africa? Will I deal with reverse culture shock like I did when I was home last year? Will I be able to lead in our marriage to best equip ourselves for God’s will? Are we being good stewards of our finances? Will people continue to support us? Where will we live in Nashville? When will we move back to South Africa? Do I need to embrace relationships with others considering the possible turnaround time? How will Carolyn adapt to international missions? How hard will that transition be? Will the kids remember me when I return? Have I served the community the way God intended? While there are some unknowns, doubts and questions about our near future, Carolyn shared with me a word from the Lord from church last week. This has given us a lot of peace as we reflect on our own word from the Lord. It’s from the story of Abraham, when he nearly sacrifices Isaac. Before this, Abraham was given a word from the Lord that he would be the father of many nations. I wonder what questions and doubts Abraham had if we were able to witness him being vulnerable? One had to be, but Lord you promised I would be the father of many nations? How can this be if I sacrifice my son? I mean c’mon, what extreme range of emotions was he experiencing? Well, Abraham didn’t ask any questions. The last part of this verse is what gave me instant peace when Carolyn shared it with me last week. As much as I have read this story I have never picked up on what Abraham says next. You see, Abraham knew he would be coming down that mountain with his son. He held onto God’s initial word and God’s initial promise. Whatever happened in between didn’t stop Abraham from walking in obedience by faith towards God’s will. I hope this word encourages you as much as it did us to hold onto God’s promise for your life. If you haven’t received a word from the Lord in a while, ask Him for one and walk in obedience by faith. Thank you for your love, support and prayers. May God’s presence bless you and those you influence.